Raw materials such as steel, aluminum, copper, precious metals and plastics are key input materials for a wide range of different electronic, electromechanical and mechanical components. We need these components to manufacture our products and systems for the automotive industry. Consequently, developments in the prices of raw materials usually influence Continental’s production costs indirectly, in most cases, via changes in costs at our suppliers. Depending on the contractual arrangement, these cost changes are either passed on to us after a certain amount of time or redefined in upcoming contract negotiations. In the reporting year, the slowing economic momentum over the course of the year resulted in diminishing demand for raw materials. Starting from the middle of the year, most quoted prices on the commodity markets therefore initially recorded a slight consolidation before falling further in most cases in the fourth quarter of 2018. Carbon steel and stainless steel are input materials for many of the mechanical components such as stamped, turned, drawn and diecast parts integrated by Continental into its products. Prices for carbon steel rose by around 7% in Europe in the first quarter of 2018 due to the seasonal increase in demand. From the end of September to the end of the year, they dropped 10% again due to seasonal factors as well as due to lower demand from the automotive industry. At the end of the year, rising prices for the primary products iron ore and coking coal had a stabilizing effect on prices. The average price of carbon steel over the year in Europe was up around 4% on the previous year. Sources: Carbon steel: Hot-rolled coil Germany (Ruhr) from Platts (€ per metric ton). Stainless steel: 2 mm stainless steel 3042B cold-rolled Shanghai market price from Shanghai Steel Home E-Commerce Co., Ltd (€ per metric ton). 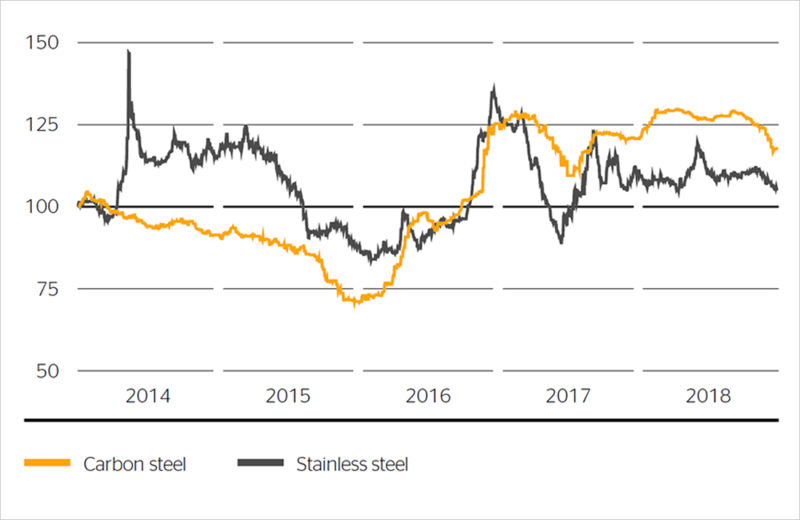 Base prices for stainless steel remained relatively unchanged in the first half of 2018 before falling almost 10% in the second half of the year. By contrast, alloy surcharges increased by up to 30% by the middle of 2018. In the second half of the year, however, they recorded a significant price decline. On average for the year, they rose in price year-on-year by between 10% and more than 20% in some cases, depending on the stainless-steel grade. The main driving factor here was the increase in the nickel price by around 25% on average for the year, compared to the relatively low average price in the previous year. 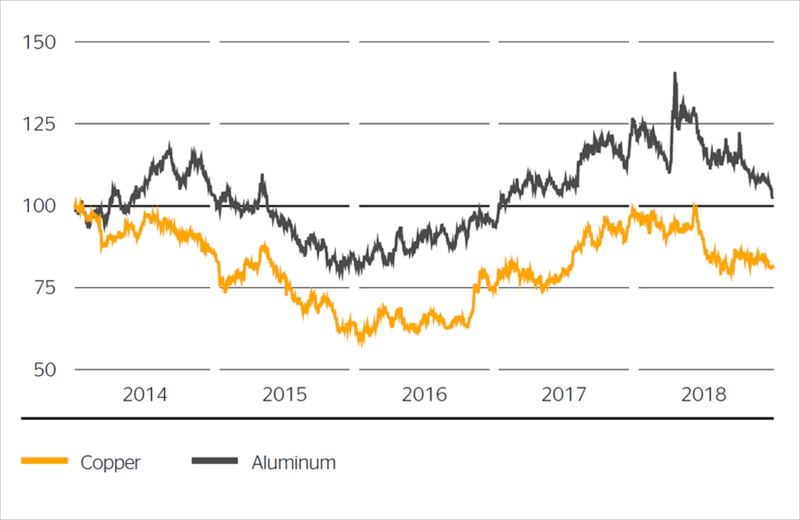 The decline in base prices compensated for the increase in alloy surcharges in 2018, with the effect that the annual average price for stainless steel in Europe remained roughly at the previous year’s level. Aluminum is used by Continental primarily for die-cast parts and stamped and bent components, while copper is used in particular in electric motors and mechatronic components. The aluminum price fell by 13% to around U.S. $2,000 per metric ton in the first quarter of 2018. In April, it rose by 25% as a result of the sanctions imposed against Russia by the U.S. government. It then decreased over the remainder of the year due to diminishing demand and ended the year down 19% year-on-year at U.S. $1,846 per metric ton. Compared to the previous year, its average price increased by 7% on a U.S. dollar basis and 2% on a euro basis in 2018. The quoted price for copper remained very stable in the first half of 2018 at around U.S. $7,000 per metric ton, before falling to a level of around U.S. $6,000 in the second half of the year. On average for the year, it increased by 6% on a U.S. dollar basis and 1% on a euro basis. Source: Rolling three-month contracts from the London Metal Exchange (U.S. $ per metric ton). Precious metals such as gold, silver, platinum and palladium are used by Continental and by our suppliers to coat a wide range of components. The gold price in 2018 remained around the average level of the previous year on a U.S. dollar basis, whereas the average prices of silver and platinum were down 8% and 7% respectively year-on-year. On a euro basis, the gold price fell by 4% and the silver and platinum prices by 12% each. After the previous year’s price increase of around 40%, the average price of palladium for the year increased by another 18% on a U.S. dollar basis and 14% on a euro basis in 2018. This was due to continued high demand for catalytic converters for cars with gasoline engines, particularly for the Chinese market. Both Continental and our suppliers require various plastic granulates, known as resins, as technical thermoplastics primarily for manufacturing housing components. The recovery in prices for plastic granulates that began in 2016 also continued in the reporting year due to the initially increasing crude oil price and growing demand. The sharp decline in crude oil prices in the fourth quarter curbed the price development of some but not all resins. Average prices increased by 10% to 20%, and in some cases by as much as 30%, on a U.S. dollar basis. On a euro basis, the price increase was around 5 percentage points lower. Continental uses various types of natural rubber and synthetic rubber for the production of tires and industrial rubber products in the Rubber Group. It also uses relatively large quantities of carbon black as a filler material and of steel cord and nylon cord as structural materials. Due to the large quantities and direct purchasing of raw materials, their price development has a significant influence on the earnings of the Rubber Group, particularly the Tire division. The price of crude oil – the most important basic building block for synthetic-rubber input materials such as butadiene and styrene and also for carbon black and various other chemicals – was very volatile in the reporting year. The lower level of production by OPEC countries led to a scarcer supply while demand remained stable. In addition, fears of an increased shortage of supply arose over the course of the year due to the U.S. government’s announced sanctions against Iran. The price of Brent crude oil consequently rose from U.S. $67 per barrel at the start of the year to U.S. $86 per barrel at the start of October. In the fourth quarter of 2018, the substantial increase in U.S. shale oil production, higher-than-expected Iranian crude oil exports due to exemptions by the U.S. government, and rising inventories as a result of declining demand put an end to speculation of further rises in the oil price. Instead, there was a sudden slump of 40% to U.S. $50 per barrel as at the end of the year. The average price of crude oil for the year nonetheless increased by around 30% year-on-year on a U.S. dollar basis and 25% on a euro basis. Sources: Crude oil: Europe Brent Forties Oseberg Ekofisk price from Bloomberg (U.S. $ per barrel). Butadiene, styrene: South Korea export price (FOB) from PolymerUpdate.com (U.S. $ per metric ton). The average price of butadiene, the main input material for synthetic rubber, rose by more than 60% on both a U.S. dollar basis and a euro basis over the first half of 2018 as a result of the increasing crude oil price and high demand. From September onward, a decline in demand for tires in China also resulted in lower demand for synthetic rubber and falling butadiene prices. 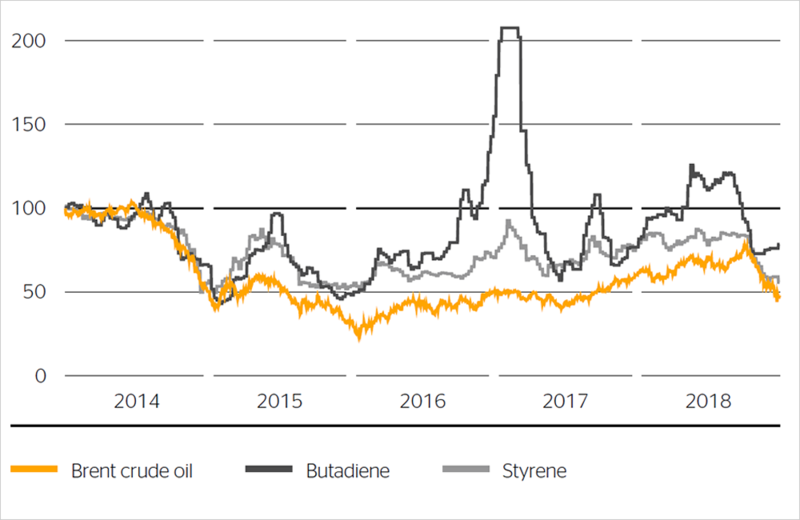 The average butadiene price for the year was down 6% on a U.S. dollar basis and 11% on a euro basis compared with the relatively high prior-year levels. Prices for other input materials for synthetic rubber in 2018 were chiefly influenced by the development of the crude oil price. For example, the price of styrene increased by around 15% on a U.S. dollar basis by September 2018 compared to the start of the year, before falling around 30% in the fourth quarter. On average for the year, styrene became 7% more expensive on a U.S. dollar basis and 2% more expensive on a euro basis. Natural rubber prices in the reporting year were unable to maintain the level of the fourth quarter of 2017, when they had stabilized at around U.S. $1.50 per kilogram. Decreasing Chinese demand for tires, particularly truck tires, resulted in excess supply, causing natural rubber prices to fall to the level of 2016 again over the course of the year. The natural rubber TSR 20 saw a decrease in its average price for the year of 17% on a U.S. dollar basis and 21% on a euro basis. 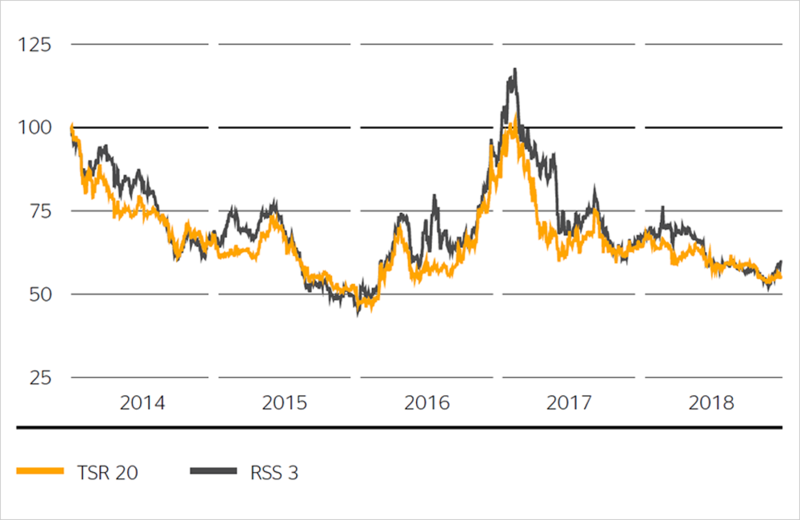 The average price of ribbed smoked sheets (RSS) for the year fell by 22% on a U.S. dollar basis and 27% on a euro basis. Source: Rolling one-month contracts from the Singapore Exchange (U.S. $ cents per kg). Overall, the described price developments for raw materials led to costs for Continental in 2018, which were passed on to our customers via price adjustments only in part and with a delay. The Rubber Group was particularly affected by this in the year under review. The decrease in raw material prices in the fourth quarter of 2018 reduced production costs in the reporting year only to a very limited extent since, depending on the product, there is usually a gap of several months between purchasing raw materials, their delivery and their use in production.